Small sedans are typically known for their good fuel economy. However, the 2019 Volkswagen Jetta rises above the rest with its impressive MPG rating. This model employs many different features that are designed to maximize fuel economy in all different types of driving conditions. On this page, sedan shoppers in Irving, Grand Prairie, Grapevine, and Dallas will find more information about the VW Jetta and its official fuel economy ratings, efficient equipment, and more. Read ahead to get started, and don’t hesitate to reach out to us at Metro Volkswagen if you have any questions! The United States Environment Protection Agency (EPA) has officially estimated that the 2019 Volkswagen Jetta achieves as much as 30 MPG in the city and 40 MPG on the highway.1 However, your mileage may vary slightly in the Volkswagen Jetta depending on your personal driving habits and the environment in which you drive. The impressive fuel economy in the 2019 Volkswagen Jetta is made possible by several different pieces of equipment, starting with its standard 1.4L TSI® turbocharged 4-cylinder engine. This engine is equipped with direct injection technology, which minimizes fuel burn off and maximizes the amount of fuel that gets into the cylinder port. The engine of the VW Jetta works together with either a 6-speed manual transmission or an available 8-speed automatic transmission with Tiptronic® and Sport mode. Either transmission is going to provide you with the same enhanced fuel economy. 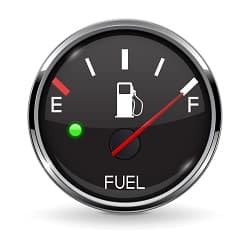 One other factor that positively contributes to the fuel economy is its light and aerodynamic body design. 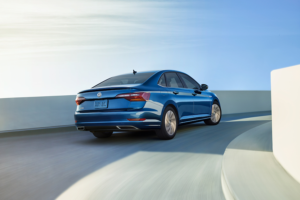 The 2019 Volkswagen Jetta has a curb weight of around 2,800 pounds and is designed to cut through wind with reduced drag. These factors make it easier for the engine to work, which reduces the amount of fuel it needs to use to move the vehicle. On top of being able to achieve such an impressive fuel economy, the turbocharged engine also offers a peppy power output. With this engine, you’ll be able to enjoy 147 horsepower and 184 lb-ft of torque. The Volkswagen Jetta also offers an available Driving Mode Selection system that lets you take control of your drive. Depending on what kind of feel and response you want, you can switch between four different drive modes, including Normal mode, Sport mode, Custom mode, and Eco mode. Each drive mode offers good fuel economy but Eco mode makes efficiency the top priority. One other feature that makes the VW Jetta run so smoothly is the available Cross Differential System XDS®. This feature, which comes only on the R-Line trim level, smartly applies brake pressure to the front wheels while you’re turning to optimize cornering even around the tightest turns. Experience the 2019 Volkswagen Jetta! As you can see, the 2019 Volkswagen Jetta offers some incredible fuel economy and efficient powertrain equipment. However, this is far from all the 2019 VW Jetta has to offer. Small sedan shoppers in Irving, Grand Prairie, Grapevine, and Dallas can experience all that the VW Jetta has to offer with us at Metro Volkswagen. Give us a call today to schedule your test drive! 1 30 city/40 highway mpg (2019 Jetta 1.4L, 6-speed manual transmission). EPA estimates. Your mileage will vary and depends on several factors, including your driving habits and vehicle condition.